If there is a gala event on the national visual arts calendar, it has to be the opening of the Asia Pacific Triennial in Brisbane. For nearly a week, the events encompass artist talks, performances, symposia and the remarkable opening night party. The Queensland Art Gallery celebrates this major exhibition in style, with an infectious sense of generosity and bonhomie. It is with this spirit in mind that Pasifika Divas were programmed to perform on the opening weekend. On a balmy September evening, 1,000 people crowd into the spacious QAG courtyard (an apparent legacy of Joh Bjelke-Peterson who insisted that the new gallery have an outdoor courtyard for parties). The guest list is a combination of artworld people and the general public—the gallery publicised the free event widely. Maori grandmothers brush up against Australia Council bureaucrats amidst the colourful ambience of party lights, bamboo huts and oversized paper flowers surrounding the central catwalk. Hailing from Aotearoa New Zealand, Pasifika Divas is a collective of performers, dancers, musicians and DJ’s. Led by the Samoan chanteuse Buckwheat, the group combines traditional Islander culture with contemporary fashion, sounds and imagery. Probably more at home in a nightclub than in a gallery, the aim of the group is to highlight the talent of the glamorous fa’afafine. Familiar in Samoa, fa’afafine culture is “an intrinsic but largely under-recognised sector of the Pacific community. Fa’afafine translates as ‘like a woman’ in the Samoan language and denotes a complex gender identification” (Maud Page, Associate Curator, Contemporary Pacific Art, QAG). The Pasifika Divas performance is very much centred on the persona of the fa’afafine and more broadly on the image of women in Islander culture. Comprising a series of vignettes, each Diva presents a short piece combining song, video graphics, dance or performance. Diva Shigeyuki Kihara is gentle and almost sombre in her dark Victorian attire, performing a Samoan maiden dance to a backdrop of historical images of Islander women in colonial dress. In contrast, Buckwheat adorned in what looks like a massive bouquet, performs to a Dana Bryant song about women at prayer on a steamy day in the Deep South. A video backdrop shows Samoan ladies in church, dressed in white, fanning themselves underneath straw hats. These contrasting images of historical and contemporary Islander life are both a celebration of the role of women and the influence and impact of colonisation and Christianity. A Pasifika Divas performance is much more than drag, as it explores what it means for a man to be coded as ‘female’ and the representation of the ‘dusky maiden’ in the Western imagination. In a delightful and celebratory way, we are presented with ideas of transgression and ambiguity which boldly pronounce ‘we are here, we are loud and we are proud.’ In some respects, this performance seems out of place in the courtyard of QAG, the audience milling around and crowding around the bars seem somewhat perplexed with what is happening on the stage. However, it is this unfamiliarity which makes the presence of the Divas so pertinent. They are here to entertain, yet they do it at their own pace and within their own parameters. The audience most engaged are the Polynesian families, clapping, dancing and singing along with devilish smiles of enjoyment. The presence of the Divas at APT adds depth to the underlying themes and directions of the exhibition, especially in relation to several participating artists. Lisa Reihana (who collaborates with the Divas) is presenting a series of large-scale photographs depicting mythic Maori female characters; Nalini Malini’s paintings and projections speak of Indian deities, sexuality and taboo; and even Yayoi Kusama’s Mirror/Infinity room, Soul under the moon 2002, conveys a sense of the liminal, or transgressive space. 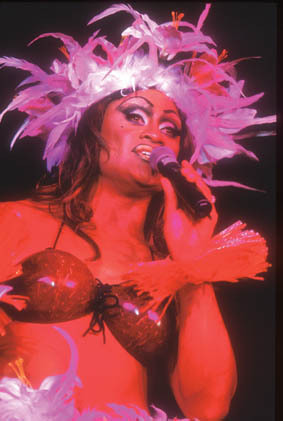 In this context, the programming of Pasifika Divas into the APT displays an astute curatorial process—on the surface the viewer is presented with a flamboyant carnival, but beneath this lies a critical and political intention to speak about mythology, sexuality, gender identification and colonisation. The Pasifika Divas are Buckwheat, Lindah E, Sha-ne’ne’, Shigeyuki Kihara and Phylesha Brown-Acton. Performance conceived by Lisa Taouma. Pasifika Divas, Asia Pacific Triennial, Queensland Art Gallery, Sept 14, 2002-27 Jan 2003.